It takes more than a little moxie to revisit the big-screen world that was so beautifully created by director Victor Fleming in The Wizard of Oz. To go “all-in” with a big-budget, 3-D extravaganza takes even more guts. So no faulting Disney or director Sam Raimi for an lack of daring. Raimi — perhaps best known for his contributions to the Spider Man series — attempts to serve up a visually ambitious prequel to the 1939 classic, a movie that still attracts viewers when its shown on TV and which still scares adults and kids some 76 years after its 1939 release, thanks mostly to those hideous flying monkeys. Moxie aside, Oz the Great and Powerful turns out to be a hit-and-miss affair with some serious drawbacks, not the least of which revolves around James Franco, the likable actor who begins the movie as a two-bit carnival magician named Oscar Diggs. Franco flashes a toothy grin to convey the phony sincerity of a small-time con man, but doesn’t do much more with his character. Early on, Diggs is swept by a tornado from Kansas to the magical world of Oz. There, he’s greeted as the living fulfillment of a prophecy that calls for a wizard to save Oz from tyranny. But Franco’s performance isn’t the only issue. There’s also a notable lack of characters to provide the level of entertainment associated with Jack Haley, Ray Bolger, and Burt Lahr as the original Tin Man, Scarecrow, and Cowardly Lion. I know. That’s an awfully high bar, but what’s the point of flying off to Oz without trying to match or jump over it? On top of that, Judy Garland’s Dorothy was a more interesting and involving character than a crackpot magician who must kill a wicked witch in order to save Oz and, not incidentally, gain access to its piles of golden treasure. Having said all that, I don’t want to leave you with the impression that Oz the Great and Powerful is a total disaster. It’s a medium-grade helping of fantasy enhanced by some skillful animation, a few spectacular sets, some decent set pieces and dollops of humor. Raimi wisely begins by following in the footsteps of the original with a black-and-white prologue that’s presented in the old-fashioned 1:33 aspect ratio. When the story reaches Oz, Raimi expands to wide-screen and color. Look, it’s clear that Raimi (and a vast special effects team) was trying for a feeling of sustained enchantment, and when Franco’s character discovers the land of Oz or gets his first glimpse of the Emerald City, Raimi seems to be on the right track. The new movie gives the emerging wizard some new companions, a flying monkey named Finley (voiced by Zach Braff) and a China Doll — she’s called China Girl — voiced by Joey King. Finley, who’s dressed as a bellhop, becomes a beast of burden, carting the faux wizard’s bag all over Oz. Although he manages some cuteness and humor, Finley simply doesn’t have either the weight or memorability of any character from the original. And China Girl might have been more affecting had the character been played a real girl instead of a CGI stand-in. All of those flaws might have receded into obscurity had the witches (there are three in this edition) provided more kick. Mila Kunis portrays Theodora, a young woman who begins as a good and trusting witch but transforms into the Wicked Witch of the West. Michelle Williams appears as Glinda, the irrevocably good witch, and Rachel Weisz plays Evanora, the witch responsible for handling much of the movie’s villainy. None of them are as frightening or as commanding as the great Margaret Hamilton, the original (and in reality the “only”) credible Wicked Witch of the West. Raimi and screenwriters David Lindsay-Abaire and Mitchell Kapner pay brief homage to Hamilton and try to create a variety of other (mostly minor) connections to the best-known big-screen adaptation of L. Frank Baum’s classic story. Now, about those flying monkeys. This version offers a more obviously fearsome version of the airborne simians, but employs them to lesser effect. These razor-toothed creatures fly at the audience, generating more by way of jolts than creepiness. The monkeys may be emblematic of the way Raimi employs 3-D throughout, more for thrill-ride impact than for the subtlety and depth that has marked the best recent 3-D, notably Life of Pi. The mix of live-action and effects isn’t always convincing, either. Too often, we’re aware that animation is being employed, although some of it is beautifully colored and alluring. I appreciated the gargantuan effort that went into Oz the Great and Powerful, and the movie may please younger audience while giving them a few scary kicks in the pants. But “not bad” is not what we expect from a movie of this magnitude and with this lineage. 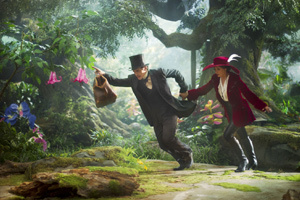 Oh, and by the way, Oz the Great and Powerful makes room for Munchkins, but not for Toto or any other dog. Pity. Rudy Cornejo: Agree with Denerstein on a very thorough and insightful review. Can't say much more, other than James Franco was a total miscast. He either didn't have his heart in it, or just doesn't have the range to eclipse the original character's credibility.